Here in the UK it’s generally thought that if you need a large and luxurious SUV that’s as capable on a muddy moorland track as it is in the badlands of Belgravia, then the preferred choice would likely be a Range Rover. Or, if the going’s particularly rough and brand image isn’t paramount, then possibly a Toyota Landcruiser. Having driven a variety of deluxe 4x4s from Cayennes to Grand Cherokees over terrain tough enough to put the fear of God into the majority of SUV owners, I know that most are capable of far, far more than the daily school run with the weekly round trip to Mudfordshire. Mercedes-Benz knows this too, but, to remind or inform the populace of its cars’ off-road capabilities, as a public relations exercise it recently staged a 65-mile coast-to-coast journey across the Scottish Highlands without driving on any public roads. The 12 vehicles – a mixture of GLE, GLS and G-Class models – were all standard UK-spec cars fitted with road-legal ‘mud tyres’, but with no other modifications apart from the removal of side steps where fitted. Leading the expedition was the iconic G-Class, which has, in M-B’s words, ‘since 1979 blended rugged go-anywhere ability and luxury’. 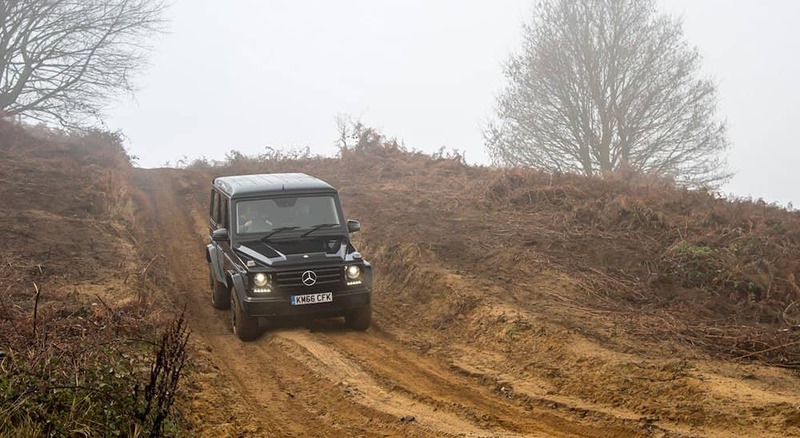 For those not in attendance at the highland overland fling Mercedes held a second press event on the less spectacular but no less demanding off-road course at Bedfordshire’s Millbrook Proving Ground. The cars were a mixture of the same models and, as in Scotland, all were unmodified apart from their knobbly Atturo Trail Blade tyres, with the GLE and big GLS models also equipped with optional Off-Road packages. Although the G-Class, formerly known informally as the G-Wagen, was originally built as a military vehicle, it soon found favour with both rural and urban civilians. Hand assembled at the rate of just 15 a day, in more recent times the G-Class’ popularity has blossomed on both sides of the Atlantic and it’s now a common sight around London’s posher postcodes, frequently in AMG guise and adorned with huge wheels, low-profile tyres, blacked-out windows, a 563bhp V8 up front and a pre-options otr price of up to £152k. This full-house AMG spec is of course wholly unsuited to even the mildest off-road work. For that you need a G 350d. With a pre-options otr price of £88,800, it’s powered by a 3-litre V6 turbodiesel that makes 242bhp along with 600Nm of torque from a lowly 1,600rpm. This is hooked to a 7-speed auto with low-range that distributes power to a permanent AWD system. A few sections of Millbrook’s off-road course were off-limits because they’re designed to test tracked vehicles, eg. tanks, in extremis, but everything else was fair game – some of it very demanding – and the G 350 took it all in its stride. On steep descents the G-Class relies on its ultra low-ratio gearbox and engine braking, perhaps with a light dab of the brake pedal, to temper the effects of gravity. I did get stuck in the G-Class just the once, while slowly traversing the challenging axle articulation humps, but this was deliberate. A twiddle of the dashboard knobs which control the three fully lockable differentials, and torque is redirected to where there’s traction. Without further ado the G 350 continues effortlessly on its way. Although the G-Class isn’t short of equipment or creature comforts, nor devoid of sophistication, it is somewhat utilitarian when directly compared with the GLS-Class. Preceded by the GL, the GLS was launched in 2015 and, in M-B’s words, ‘it confirms its position as the S-Class of SUVs’, or in other words, it’s the ultimate Mercedes SUV. Like the G-Class, the GLS can also be had in full AMG guise with a ferocious 577bhp, a 4.6 second 0-62 time and a £103k pre-options price tag, but that’s also probably not the best choice should you ever wish to venture off the beaten track. For that you need a GLS 350d. With a pre-options price of £78,855 (in ‘designo line’ spec), it’s powered by a 3-litre V6 turbodiesel that makes 254bhp along with 620Nm of torque from a lowly 1,600rpm. This is hooked to a 9-speed an extended ‘Dynamic Select’ auto with drive to all four wheels. 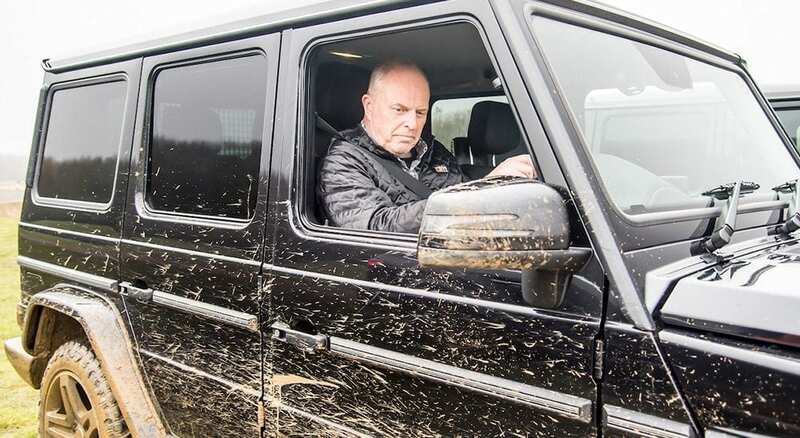 I had thought that the bigger 7-seater GLS might struggle in the more difficult Millbrook sections where the G-Class had breezed it, but that was not the case. Thanks to Airmatic air suspension with adjustable ride height (the G-Class has non-adjustable gas shocks with coil springs), the GLS went everywhere the G-Class went but with much less driver input. And where I’d paused in the G to consider diff lock variables, gear ratios and whether I might need to touch the brakes, the GLS took care of all that itself, regardless of terrain. As the day at Millbrook didn’t involve any on-road driving I arranged the loan of another GLS 350d designo line, this one without the Off-Road package but complete with other options including the Driving Assistance package bringing its price to £83,995 otr. With a generous 680 litres of loadspace with the pair of third-row seats electrically folded flat (or a humungous 2,300 litres with both second and third rows folded), this was just the ticket for a pre-Christmas weekend break, with a spot of shopping for good measure. And so with four aboard and the lovely De Tuilerieen Hotel in Bruges programmed into the satnav we set off for the DFDS Dover-Calais ferry – naturally with priority boarding and premium lounge facilities as befits the occupants of a car of this elevated status. The G-Class represents a niche within a niche and it has become a modern day classic; it’s highly competent but, compared with the GLS, it’s distinctly old-skool, and therein lies its amazing longevity and appeal. The GLS is a luxurious, highly capable all-terrain liner better suited to the boulevards of Beverly Hills than the cobbled streets of Bruges, but as this is written there are just 1.5 hours ‘til Mercedes takes it back and I shall miss it. If you’re looking to purchase a Mercedes G350/GLS350, or any other prestige, classic or supercar, call JBR Capital on 020 3355 0035 to discuss your finance options. Protective underbody panelling, centre differential lock, low-range gearbox, auto transmission with full manual mode, off-road programming for ABS, ESP and 4ETS, three extra selectable ride heights for the standard AIRMATIC suspension and Off-road Plus mode (in addition to Off-Road mode) for especially difficult terrain. Blind Spot Assist, Active Brake Assistant with cross-traffic function, Active Lane Keeping Assist, Distance Pilot DISTRONIC with Steering Pilot and PRE-SAFE+PLUS.